An iron entry door is one of the greatest pieces needed to complete your home. Why? At Signature iron Doors we hand forge all our products, giving each door a personal touch for you. We have ornamental iron designers and technicians working side by side to produce the highest quality iron doors, gates, and railing. Whether you want elaborate scroll work or simple bars, it’s our guarantee you will love your finished product. Aside from the astonishing aesthetic appeal Signature Iron Doors provide as your guests first impression, they are made with 14-16 gauge steel, fully insulated, with dual panned tempered glass. Their zinc primer and epoxy paint provide for a long lasting finish able to endure all weather conditions. 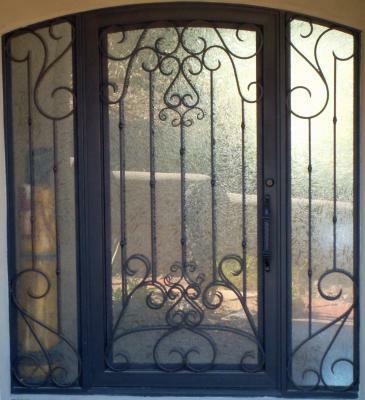 Although Signature Iron Doors are completely wrought iron, they are easy to function, but impossible to break through. You and your loved ones can enjoy the ease of opening your wrought iron door with its roller catch or your garage doors gliding track system, but any intruder has no luck getting through your Signature wrought iron doors. We ship globally and can provide you with drawings and estimates wherever you are. Our largest showroom is in Phoenix Arizona, close to where we built these entry doors in Glendale Arizona. Call us now and come by our showroom to find out why Signature Iron Doors are the answer to your home’s completion.